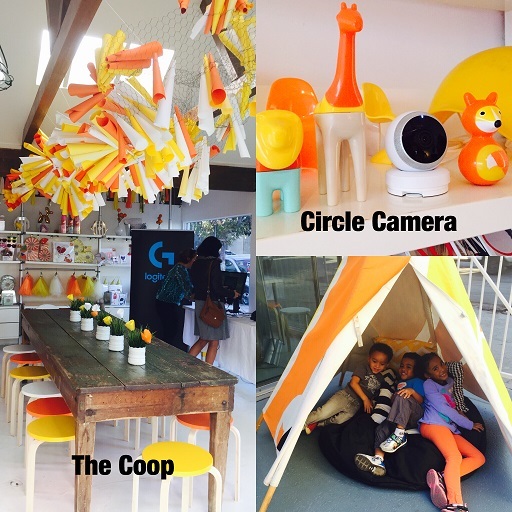 Bern-Baby-Bern: Logitech Hits A Homerun with Holiday Gifts for the Whole Family! Logitech Hits A Homerun with Holiday Gifts for the Whole Family! 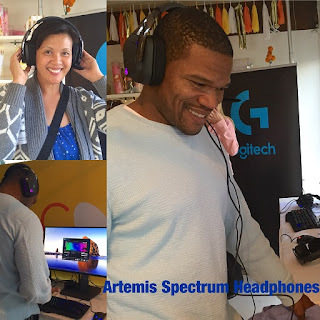 When my family and I got invited to preview the latest gadgets from Logitech at the Coop L.A., the automatic answer was, "Heck, YEAH!". So you mean to say that I get to try out all of your newest products AND my kids will be occupied and entertained?! Someone's been reading my diary!!! My first stop was at the Logi BLOK protective case demonstration area where they clamped a brand new iPad 6 feet in the air then had one of the kids release it onto the ground. Of course, every kid was excited for their turn to drop the iPad and send it plummeting down. 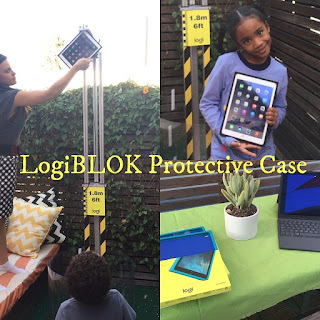 That's right, the same iPad dropped over and OVER again without breaking because it was protected by the Logi BLOK case. I cringed every time it happened and EVERY time I was amazed that the iPad was completely fine! If your kids have sticky fingers like mine then you'll definitely have to put this protective Shell or Case on their wish list. The next station was the Artemis Spectrum headphones. I slid them on and listened to "Hello" and it felt like Adele was singing right beside me. I could almost feel the wind from the video. Ok, I'm exaggerating but that's how crystal clear the sound IS. Plus, my hubby loved the customized lighting features on the headphones. My husband also played a couple of games with the portable Atlas Spectrum keyboard and the lightweight Daedalus Apex gaming mouse and he said both worked seamlessly together. When you combine the headphones, keyboard and mouse, he said the experience will definitely be a hit with all the gamers out there. I, on the other hand, was more impressed with the fact that the ear guards are washable! You hear me, WASHABLE! Every mother's dream. Last but not least, my favorite gadget the Logi Circle. It's a camera that allows you to monitor your home no matter where you ARE! This is perfect especially for travelers. If you ever just want to check in on your pets, sitter or kids, you can do so right from your smartphone. It's portable, rechargeable and can last up to 12 hours in power save mode. I love the fact that you can get a 30 second day brief of the most interesting things that happened that day. Really convenient for capturing those moments you would miss when you're away from home. So if you're stuck on a gift idea this holiday season, check out Logitech because they'll definitely have something for the whole family! Disclaimer: No monetary compensation was received for this post. I was gifted the items mentioned on this review and all of the thoughts expressed on this blog are my own personal opinion.